The Pacific Community (SPC) and the European Union (EU) have commissioned the installation of 400 solar photovoltaic home systems to help affected communities in Fiji recover from tropical cyclone Winston. 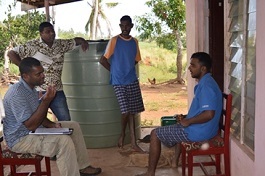 The FJ$10 million EU-funded Fiji Micro Projects Programme (MPP) was redesigned in May 2016 to provide medium to long term response measures following a visit to cyclone-devastated areas by the EU Ambassador to Fiji and the Pacific, H.E. Andrew Jacobs, and the Pacific Community Director-General, Colin Tukuitonga. Rural electrification, specifically improved access to affordable electricity, and increased income generating opportunities is one of two key result areas of the project. The second focus area involves better access to safe and disaster-resilient water supply, sanitation and hygiene facilities and practices. The rural electrification through solar initiative will directly benefit around 2400 people from remote households surveyed and identified within the TC Winston-affected areas in Fiji’s sugarcane-belt, located between Sigatoka and Rakiraki. Category five Winston is the strongest tropical cyclone on record to make landfall in the Southern Hemisphere, claiming 44 lives and inflicting devastating damage to communities on many of Fiji’s islands, earlier this year. Power generation across the country was also greatly affected, with an estimated loss of up to 80 percent experienced in a number of provinces. The solar kits are able to power eight lights, small radio, flat screen TV and charge a mobile phone. A small number of the systems being provided will have the capability to power a water pump and an energy efficient freezer. “This is a positive step for Fijians on their road to recovery from TC Winston and we thank the EU for their support and partnership with SPC to enable this to happen,” Pacific Community Deputy Director-General, Dr Audrey Aumua, said. The installation of the solar systems is expected to be completed by mid to late 2017.